When will gambling be legal in the U.S.? By the end of this decade. States—and mobile developers—are fighting for a slice of a $30 billion pie. 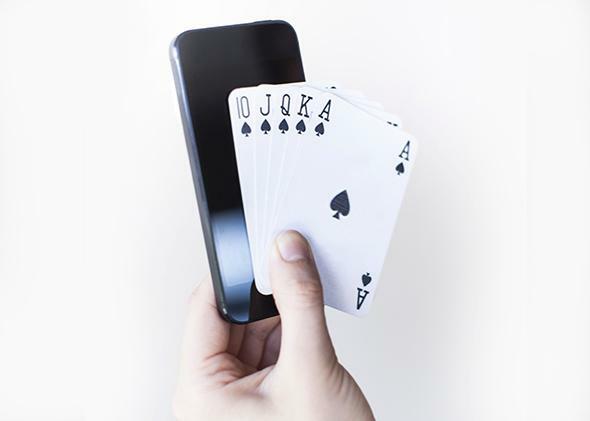 Mobile gaming will be a royal flush for the companies that bet on it. True to the name of this column, I’m going to place a wager. I predict that gambling will be broadly legal in the United States by the end of this decade. It will start with online poker, which is currently legal only in Nevada, New Jersey, and Delaware. But it will expand from there, both in categories of games and in geographic acceptance. This is already happening, to a certain extent: The wheel’s started spinning, and the ball is in play. When it drops, the video gaming business will win big. The makers of today’s mobile games will build tomorrow’s mobile casinos. They’ve tried before. Zynga, the granddaddy of social gaming, launched a real-money gambling site in the U.K. last year, calling it Zynga Plus Casino. It collaborated with bwin.party, a Gibraltar-based gambling company that reported nearly 770 million euros in revenues in 2012. (That’s about $1.05 billion in current dollars.) But Zynga has had a tougher time gaining headway in the U.S. Entrenched anti-gambling statutes and complicated interstate regulations are difficult hurdles to clear. Barely a few months after it had opened its casino for business in the U.K., Zynga told analysts that it had given up on plans to let Americans in the door. By attacking a specific aspect of gambling—namely, the transmission of funds—the UIGEA appears to cut off online gambling at the ankles. If no financial company is willing to handle transfers, then online casinos won’t take on American customers. The law’s specificity, however, leaves wiggle room at its margins. For one thing, the UIGEA does not seem to apply within the boundaries of states that have already legalized various forms of gambling, or that may do so in the future. But logistical troubles remain: Any businesses running legal online casinos or poker tables must operate entirely within a given state. The UIGEA seems to prohibit the transfer of funds for the purposes of gambling across state lines. Let’s look at the states themselves. At present, all states in the Union, with the exceptions of Hawaii and Utah, allow for some forms of gambling. Commercial casinos (i.e., for-profit gambling enterprises not including those run by Native American tribes) are permitted in 20 states and two U.S. territories. At the moment, just shy of 500 commercial casinos are up and running in the country. Las Vegas is the biggest and best-known gambling hub in the U.S., but gambling is just about as legal in, say, Iowa or Michigan as it is in Nevada. These states, and the companies doing business within them, will begin to compete for your dollars—especially online, where you’re most readily available. They’ll start the fight by making gambling as seamless and convenient as possible. The Nevada Gaming Commission, for instance, just voted 4–0 to approve the use of prepaid debit cards for slot machines. The cards could be tied to players’ loyalty points and slots clubs at Nevada’s major casinos. The biggest among them, including Caesars Entertainment Corp. and MGM Resorts International, operate hotels and casinos across the country and around the world. They’ll press for the ability to keep players clubs—and prepaid debit accounts—applicable throughout their interstate gambling ecosystems. They can’t legally do that now, but they’ll have very strong financial incentives to sponsor amendments or challenges to the UIGEA. In the meantime, they’ll redouble their efforts in gambling-friendly states. Nevada is leading the charge in online gambling innovation. But other states will up the stakes—especially those states that don’t, or can’t, rely as heavily on in-person tourism. New Jersey, in particular, is rapidly liberalizing its gambling policies in an attempt to outdo Nevada. Atlantic City’s tourist traffic and gaming revenues have been declining for most of the last decade. Lawmakers in the Garden State are eager to reverse its fortunes online. State Sen. Raymond Lesniak recently introduced legislation that would open up its online gambling sites to players from out of state. Within the state, the sites are flourishing. In January of this year, players had created a total of nearly 200,000 accounts, bringing New Jersey’s online gambling revenues to $9.5 million for that month alone. If and when the Nevada-Delaware compact bears fruit, other states will want to get in on the action, because revenues from online gambling will prove too tempting to resist. Worldwide, revenues from online casinos exceed $32 billion, and Juniper Research estimates that revenues from gambling on mobile devices alone will top $100 billion by 2017. As more states soften gambling laws, and more follow the example set by Nevada and Delaware, expect the $12 billion mobile gaming industry to pay close attention. Zynga, King, and other giants in the mobile gaming business won’t be content to sit on the sidelines. I suspect they’ll strike partnerships with state-based gambling companies to provide the software for the next generation of virtual casinos. They’ll build the infrastructure now, and they’ll move quickly as the walls of the UIGEA continue to crumble, brick by brick. In the near term, they’ll create an interstate gambling ecosystem linking Nevada, Delaware, New Jersey, and other states with congruent online gambling policies. Over time, more states will fill in the framework. As the Internet goes, so goes the real world. In the long run, I don’t believe offline gambling will remain grounded while online gambling takes off. States like California will loosen their commercial gaming restrictions in an effort to promote tourism. A cascade effect will see state after state lowering barriers and courting casinos, virtual and physical. Overseas competition will make states, and gaming companies, work faster and harder to ensure their customers the best, most convenient, and most rewarding casino experiences. This all seems a little far-fetched today. (And I’m not the first writer to speculate about a coming casino boom in the U.S., nor will I be the last.) Perhaps the change will come more slowly than I predict it will. Perhaps it’ll come a lot quicker. The one thing I can say is that it’ll come. I can’t actually bet on it. But when I can, I’ll collect. Correction, March 4, 2014: This article originally stated that the U.S. District Court in the Southern District of New York issued a ruling against the founders of PokerStars, Full Tilt Poker, and Cereus (Absolute Poker) in United States v. Scheinberg (2011). Instead, PokerStars and two other defendants settled the case with the prosecution in exchange for the forfeiture of over $731 million.